Retail has demanding customers, hyper-competitive markets, increasing promotions and new product introductions, and other complex demand drivers that have major implications on your business results. 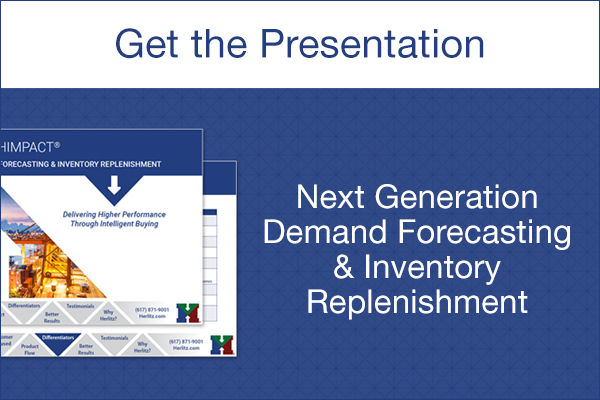 HIMPACT with integrated multi-echelon demand forecasting and inventory replenishment solution can improve your supply chain performance, satisfy your customers, and help you optimize your market position. Over the past 3 decades, we’ve developed innovative solutions for retail inventory management, continually honed and refined them, working with our hundreds of customers around the world. HIMPACT was designed from the ground up to provide superior results for both store and DC integrated in the same solution. When it comes to analyzing, optimizing, and managing inventory nobody is better than Herlitz IM. Our store grouping store/set capabilities support product rollouts, allocation of products, presentation stocks, seasonal profiles, and rankings. Promotion planning is integrated into our demand forecasting and inventory replenishment along with open to buy. We support any and all item replenishment methods: min-max, presentation stock, or planogram based. Replenish your inventory with accuracy. Demand forecasting offers a truer picture of Demand and a reference point for planning future events. The demand history is segmented into regular, lost, and promotion categories. Service and Profitability management extends down to the store sku level, providing additional margin and better service. With or without a perpetual store inventory, we have proven methods to support replenishment. Besides these key function, HIMPACT is designed to provide results, the buyers workbench daily provides alerts on any forecast, planning or service exception. Manage to specific service levels, make adjustments to increase profits. To read more about HIMPACT’s new innovative approach, click here. Additionally, our retail solutions can be easily integrates into your legacy systems to provide additional functionality whether you utilize Oracle, Microsoft Dynamics, or any enterprise resource planning (ERP) system.